Our task was to design and build a tele-operated Human/Zombie Vehicle (HZV) and a companion Living/Undead Controller (LUC). Groups of HZVs operate in a pond and the specifications are as shown in the Figure below. 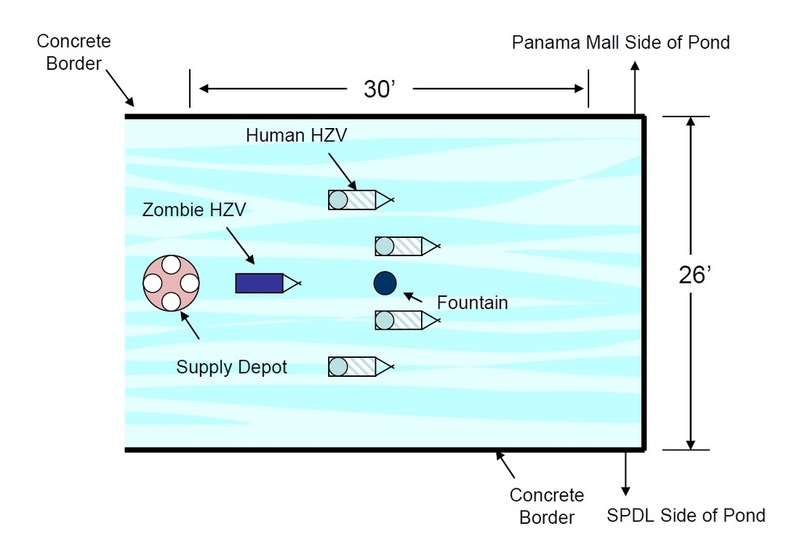 During rounds of the game the Zombie vehicles will attempt to convert the Human vehicles into Zombies and the Human vehicles will attempt to capture supplies from floating islands. We chose our Human/Zombie Vehicle to be named after a warship 'Alligator'. 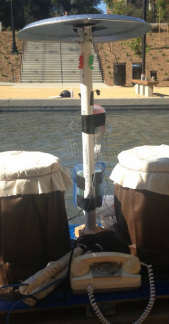 It has two propellers and they are controlled for both direction and speed control. The vehicle is controlled from a distance using a controller. We designed the controller to be in the form of drums. The speed of the vehicle directly depends on the drumming rate. Movement towards right and left directions depends on the the side of the drum being played. If the right side drum is struck more than the left, the vehicle turns towards right and the similar behavior for the left. If both the drums are played at same rate it moves forward. To reverse the direction a switch on the drumstick needs to be toggled. At the start of the game the controller takes control of the vehicle by selecting its number, in our case a phone dial is used to select the vehicle . For popping the balloon to either feed as a human or attack the human as a zombie, the cymbal needs to be struck on the controller. Cymbal to pop a balloon.